Health Aid Vitamin C plays an important part in maintaining healthy gums, teeth, skin, immune system, connective tissue and bone. It also acts as an antioxidant which may maintain blood cells and vessels. 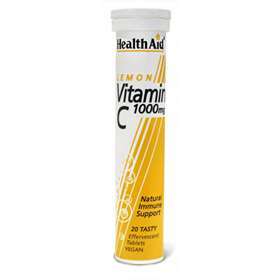 Health Aid's Vitamin C is specially made to be quickly absorbed and not to irritate the stomach. Tasty lemon flavour also in Orange. Free from Yeast, Gluten, Wheat, Soya, Dairy and aspartame. Suitable for adults and children over the age of 12. Take one tablet daily, to be dissolved in a glass of water. Do not exceed recommended dose. Vitamin C (ascorbic acid), Acidity Regulator (citric acid anhydrous, sodium bicarbonate), Sweetener (sorbitol, mannitol, sodium saccharin), Bulking Agent (calcium carbonate, starch 1500), Flavour Enhancer (natural lemon flavour).